Members of Maple Street Save-the-Planet Club are cleaning up Gilroy Park when Ryan has a brainstorm: Instead of throwing aluminum cans in the garbage, why not bring them to the Recycling Center and use the money to buy flowers to decorate the park for Earth Day? Mrs. Watson, the club's advisor, figures out that they're going to need 5,000 cans, so the kids start a big collection campaign at school. Cans are grouped in bags of 10, 100 and 1,000. 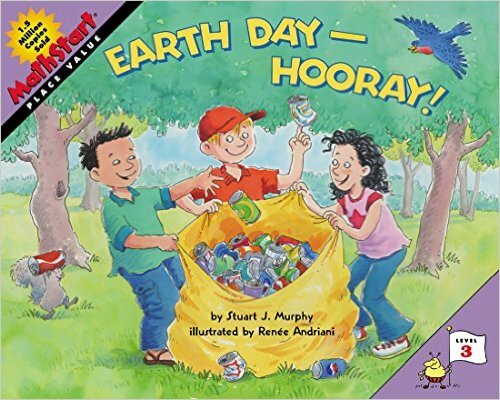 Recycling facts are sprinkled throughout the illustrations. Understanding place value is key to working easily with large numbers.